Screen-Free Week is all about unplugging from our electronics and connecting with our friend, families, and neighbors. Feel free to join us at as many of our events as you want … whatever makes sense for your family. Remember: This is an adventure, not a mandate. Explore the idea of unplugging, have a sense of humor about the obstacles, and just give it a shot. No guilt if it just doesn’t work for a given night. Grab your family or some neighbors and play some games, go for a walk, etc. For all students who took the pledge and completed their activity log AND Spirit Night at Atomic Trampoline! A fundraiser for Boy Scout Troop 39. Features over 20,000 sq ft of exhibit space, multiple interactive activities and a dedicated build area where kids can build with over 100,000 LEGO and DUPLO bricks. Round Hill Outdoors celebrates Screen-Free Week as a way to help our community discover the joys of life beyond our electronics. Check our post about last year’s fun. Children, families, entire schools, and communities will rediscover the joys of life beyond the screen. Plan to unplug from digital entertainment and spend all that free time playing, reading, daydreaming, creating, exploring, and connecting with family and friends! Instead of watching TV, surfing the web, or playing with apps and video games, they read, play, think, create, get active, and spend more time with family and friends. Remember, Screen-Free Week is about taking a break from digital entertainment. You can celebrate, and still use devices for work or school. But if screens of any kind interfere with family time (including meals), you may want to rethink how and when you’re using them. 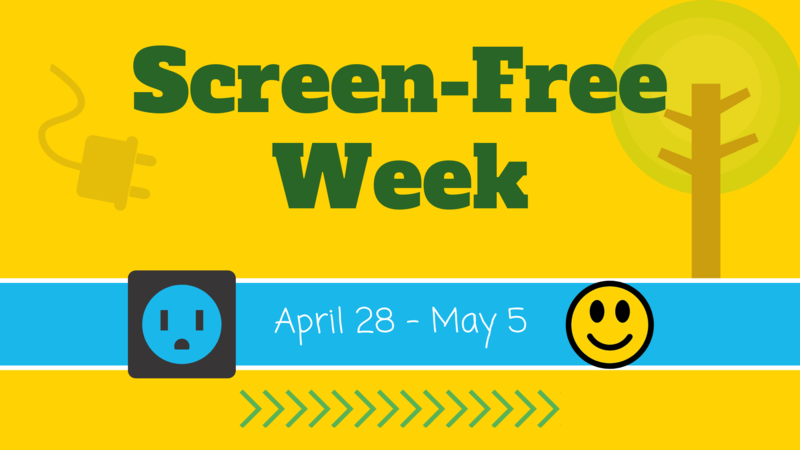 Try to get everyone in your family on board forScreen-Free Week. If adults are fully committed, children feel everyone is sharing the experience and is taking it seriously. Decide what “screen-free” means for your family. Does it include email and text messaging? Are you still going to Skype with family members in another state or country? There’s no “right” way to do this, but make sure that you’re all clear about what your commitment will be. Make plans together for the week. Start planning in early April (or sooner) so that by the time Screen-Free Week rolls around, everything is in place and ready to go. Make sure that everyone (who can) has a specific responsibility and an equal vote on key decisions. Set a calendar of activities and events for the week. One goal of Screen-Free Week is to allow kids unstructured time to generate their own screen-free play and activities. But, especially if this is your first time participating as a family, you’ll want to make sure that you are not left twiddling your thumbs. It’s most important to schedule some family activities in the early part of the week so that everyone can adjust to being screen-free. If you need some help thinking of ideas, check out our list of 101 Screen-Free Activities. Reclaim the family meal as a time for talking together and/or sharing stories. Plan your meals ahead of time and include the entire family (when possible) in the preparation and presentation of the meal. Get creative with napkin folding. Are you going to use candles one night to make that dinner special? Think of different ways to spice up the evening…maybe a discussion about a book everyone in the family has agreed to read? Include friends, relatives, and neighbors in what you are doing, even if it’s for just one day or evening. Get together with other families at a park, play organized games or just hang out! At the end of the week, talk about how you feel, what all of you have accomplished, and what aspects of the week you would like to keep going. Is it worth it to make one night a week screen-free, with meals together and a game following dinner? Would it be a good idea to get together with extended family or friends one day or evening a week and do something different? The key is to find out how everyone feels, and share the pluses and minuses—both to figure out how to make Screen-Free Week even better next year and to reduce your dependence on screens all year round. Daily emails during Screen-Free Week with tips and inspiration on improving your family's life by unplugging and reducing your screen time. Congratulations on your first step! You'll receive an email asking you confirm your signup.